Judy, our resident EMF (electromagnetic frequency) watchdog has alerted us to submit comments on the FCC’s proposed regulations that would allow widespread and rapid deployment of a “5G” network under a proposed “streamlining” of the siting process. Not only is the justification of deployment weak, there are many reasons that large scale “streamlined” (minimal government oversight, especially at the state level) and rapid deployment is a very bad idea. The US is the only government eager to embrace this technology despite the health risks of EMFs. Comments are due March 8th. (An excellent explanation of the issues will shortly be available when www.whatis5G.info goes live). There is consistently mounting evidence of the health risks of EMFs for humans and their pets, as well as nature. There is considerable data showing that electrical pollution is one of the main factors in the loss of bees. Without bees, most of our foods cannot be raised because they rely on bees for pollination and seeds for future generations of food. Humans have shown a wide variety of problems from exposure to ever-increasing levels of frequencies in the microwave region of the energy spectrum, which is why safety standards for short exposure to microwave ovens became the basis for safety claims. These include headaches, dizziness, confusion, sleep problems, heart problems (mostly palpitations), and pain or numbness in limbs. Animals show similar symptoms. The materials used for the technology come mainly from the Congo, where the military forces children to mine precious metals for the benefit of a few Congo elite and their international customers. As if that wasn’t enough to get you concerned, there are also cyber security and privacy issues. There is also a fundamental lack of justification for 5G. The use of wireless technology to transfer information uses far more energy than the alternatives, fiber optics and cables. These other technologies require more labor in installation (creating more employment opportunities) and provide superior performance without many of the downsides of wireless. Wifi is cheaper to install, but this is simply a boon for the utilities that supply electricity. More basic than that – do we really need a lot more information? The FCC’s presentation of the issues can be found at http://transition.fcc.gov/Daily_Releases/Daily_Business/2016/db1222/DA-16-1427A1.pdf. Please note: this link is to download a PDF document. Click on the tab “Express Comment” at the top of the page to simply make a text comment; click on the “Standard Filing” tab to attach documents (one of which will be your comment). Enter “16-421” in the “Proceeding(s)” Field. After a brief moment “16-421: Streamlining Deployment of Small Cell Infrastructure” will appear as an option – click on it to select it, and a yellow square with the docket number will appear in the field – you are ready to comment! Fill out all required fields (hit “Enter” after you enter your name or it will not be saved). Once all fields are filled out click “Continue to Review Screen” at the bottom of the page. Review to make sure all is how you intended, and click “Submit”. Write down your confirmation number so that you can check on your submission. Whew! Why is commenting such an involved process? Making your voice heard may not be easy – but it is the only way anything ever changes. Thank you for taking the time to make your voice heard on this critical public health issue. We are exposed all day every day to EMF from radio and TV. Of course if you go around all day long with a cell phone hanging out of your ear, it can affect you. I have a cell phone, but do not carry it with me all of the tine, usually only when I am traveling. I go swimming every day but do not take the phone with me. I have worked in electronics with microwaves since 1961 and do not have any cancer or brain tumors. The lobbying to preempt local control on this siting process is fierce. Everyone should be vigilant because the wireless industry is lobbying the states too. There are bills pending in Florida and Virginia, and Ohio has already passed one. 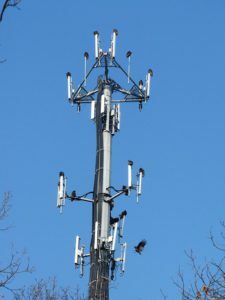 Voices need to roar loudly or you will wake up with a mini-cell tower on your front lawn – they want unbridled access to residential rights of way. These initiatives can best be called “Spy and Fry”. I have migraines and get shots plus take medication for them. I suffered a head injury and now have a TBI Trumatic brain injury. Going to 5G will mean more migraine days for me in a life that is already fill will constance headache. Has anyone done a study on what these frequencies do to people that already have brain injuries not just in healthy brains.? I think they would find amazing but terrifying results. For myself I do not want to find out first hand. This needs to be stopped. So much evidence exists that a 5g network will be catastrophic to health. At the very least we should have studies that will confirm or,deny initial findings. Moreover, we do not need a 5g network, making the risks completely unnecessary at this time.